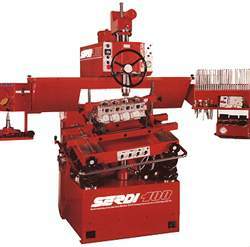 The Serdi 100 is a cylinder head centre dedicated to the machining of valve seats and valve seat inserts. The machine is distinguished by its pneumatic operation of a work head which floats on air and a spherical air cushion within the work head which allows total spindle movement in any plane to ensure total centring accuracy and machining concentricity. The Serdi 100 also features a surface table mounted on a pivoting central column and supported on four adjustable pneumatic legs. This arrangement means that not only can the height of the table be adjusted but also that the table can be tilted. This enables cylinder heads with compound angle valve arrangements to be accommodated. The machine also has a large throat capability meaning that it can handle work on very tall pieces. 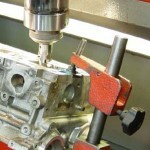 The best example of this is converting a Cosworth cylinder block to accept long head studs. The machine column is manually operated via a steering wheel type arrangement. This is used to raise or lower the column when centring or cutting operations are required. The column spindle is machined to accept a variety of interchangeable morse taper type tool holders which carry both pilots and cutting blades. Pilots are parallel ground carbides (available in 0.1mm increments to give the best possible fit). With a pilot mounted in one of the tool holders the centring operation can be carried out. The centring operation is achieved by first floating the main work head into position above the guide bore before inserting the carefully selected pilot into the guide. Once the pilot is in position within the guide bore the floating sphere part of the work head can be released. A combination of the pilot fitting snugly within the valve guide and the work head floating on a cushion of air both in the sphere and under the bed mean that the pilot can self centre concentrically with the valve guide. Once the operation is complete the two air cushions can be switched off allowing the spindle to lock in position. The machine is now centred and ready for any machining operations to begin. For machining valve seat angles the Serdi 100 uses multi angle carbide form cutters mounted in adjustable tool-holders. In theory, any combination of valve seat, top cut and throat angles are achievable to suit every conceivable seat angle combination. At H T Howard we have a vast selection of cutters but even if we don’t have exactly what is required, special one offs are available to order. 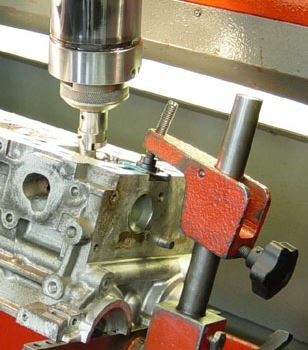 When machining, a minimum of three angles are used on each valve seat. The adjustable tool holder is used to set the cutting tip to the exact valve seat diameter required. By using pre-formed carbide cutters multi angle valve seats are produced consistently and accurately at the ideal position on the valve. Each machined valve seat will have the same diameter and width as the last. The additional machining column depth stop can be used to ensure that each valve seat is cut to exactly the same depth in the combustion chamber.